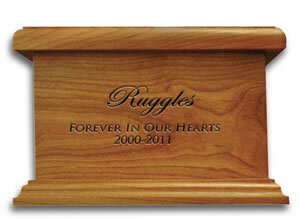 Cherish your pet forever with this engraved memorial urn. 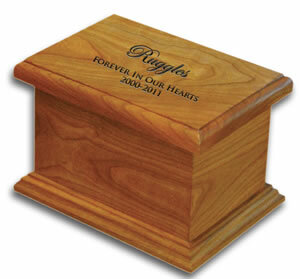 This urn is handcrafted in the United States of genuine hardwood with a high quality lacquer finish in cherry or maple. The bottom of the urn has a removable panel with brass hinges so the cremains can be enclosed. Your pet's name is engraved with the font shown (Cursive) and the balance of the text is engraved as shown. This beautiful urn is designed for placement indoors. Up to 50 characters of text (including spaces) can be added. Outside Dimensions: 5.75" x 4.25" x 4.75". Inside dimensions: 3.5" x 2.375" x 3.25"
Holds cremains for a pet weighing up to 45 lbs. Outside Dimensions: 7" x 4.75" x 5"
Inside dimensions: 4.68" x 2.68" x 3.25"
Holds cremains for a pet weighing up to 80 lbs. Up to 150 characters of text (including spaces) can be added. Outside Dimensions: 8.25" x 5.75" x 6.25"
Holds cremains for a pet weighing up to 120 lbs. Outside Dimensions: 9.25" x 6" x 6.75"
A free draft is provided, along with a modification to that proof, if needed. After three proofs, we will contact you to discuss the cost of further modifications. 2. Email the text to us. Please include your Order Number on the subject line so that we can associate your text with your order. Q: Can I have different text on the top and bottom?